The original crew. The whole concept of Soundwave and his cassettes was pretty much the coolest sci-fi cartoon thing I'd ever seen. The jets look ominous, while the Autobots seem congenial in their colors. Note the blue Bluestreak. 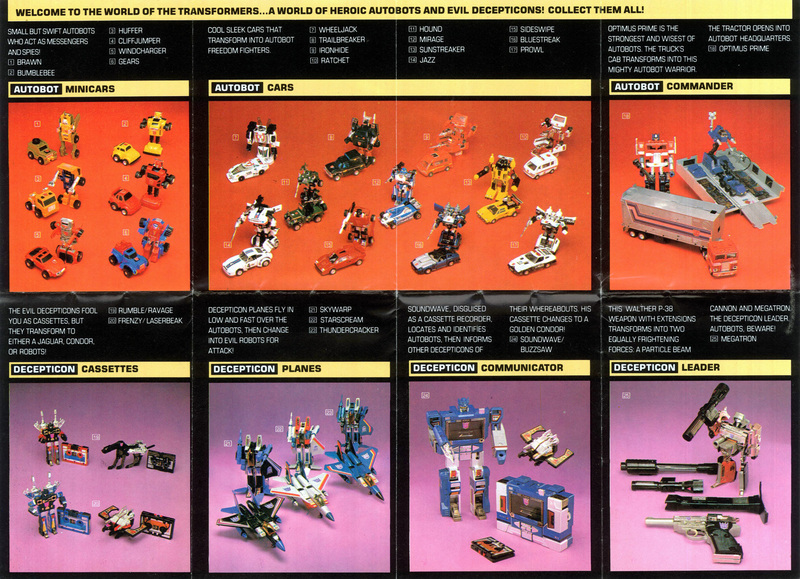 But for all these toys, doesn't Optimus Prime look like the one you most want to own? Here we have the origins of one of the most fantastic action figure lines to ever be created. I actually slept with this catalog under my pillow when I was 10. Just looking at this flyer fills me with a sense of excitement. All the cars and the jets were great. And we all had our favorites and still do. And then I saw that they had a TF cartoon. And I didn't sleep for a week.